Sail Sensations Cruise sets sail from Benoa Harbor for an exotic day during in which the guests' senses will be stimulated. Bali Sail Sensation Cruise program starts at 9am with 1,5 hour sail to Nusa Lembongan, from Bali 's neighbor island. During the journey, guests have the opportunity to participate in the operation of the vessel or simply be pampered by their own personal assistant. A 'personal assistant' is assigned to them to help organise their day. "The Anchorage ", sailSensations' day facility on Lembongan island is situated on a 4,500 square meter terraced area adjacent to the white sandy beach. An oasis where exotic Balinese bales have been erected to create a cool serene setting amongst the palm trees. Marine activities are offered from "The Anchorage" where guests can enjoy swimming, snorkeling, and more. Only with Sail Sensations Cruise can guests enjoy a guided snorkeling safari over the best coral at Lembongan. SCUBA diving for first timers or qualified divers is also available. What the activity look like? To explore the rural scenery and traditional aspects of Nusa Lembongan, we offer several tours showing you the best kept secrets of these beautiful islands. From the unique and highly recommended 'mangrove tour' to the village life, we offer various choices unlike any other. Lunch is a social occasion where ambience and trend is important. For our guests we provide a variety and choice of delicacies to pamper the most demanding palate. Barbeque buffet lunch is centered on a tropical grill set in the gardens of "The Anchorage". Our internationally trained chef makes eating here an event to remember. Participants will be picked up directly from the hotel or villa places to stay (Area: Seminyak, Kuta, Legian, Nusa Dua, Jimbaran, and Sanur) in the morning. Takes about 30 minutes heading for the port Benoa (depending on the condition of the highway traffic jam). Arriving at the Port of Benoa, all passengers are required to fill out a form. Then, we will welcome into the yacht. Food provided by Sail Sensation Cruise we can enjoy as much. Passengers can also be outdoors to enjoy the warmth of the morning sun shrouded sea breeze. If lucky, the dolphins can be seen while cruising accompany us and show a sense of happiness as dancing with the passengers. Arriving in Nusa Lembongan, we will be guided towards a hotel called the Coconut Beach Resort where we can enjoy a variety of water activities in this place such as water slides, swim, or just relax. Lunch is also served in this place with enough food delicious. Satisfied enjoy it all, guests will be invited back to the Sail Sensation Cruise to return to the island of Bali. We will arrive back at the hotel around 4 pm. The island is quite big and it can take over 45 minutes to cruise from one side to another depending on where your accommodation is located. The roads are improving very quickly throughout Nusa Penida as tourist traffic increases but if you are a novice scooter driver this is gonna be an interesting journey for you! 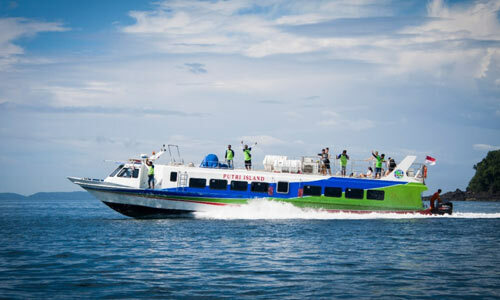 Most of boat operator offer you the Lembongan fast boat transfers with 3 times schedule a day depart from Sanur and offer complete transportation included pickup and drop service to your hotel in Bali and also transportation in Lembongan Island. 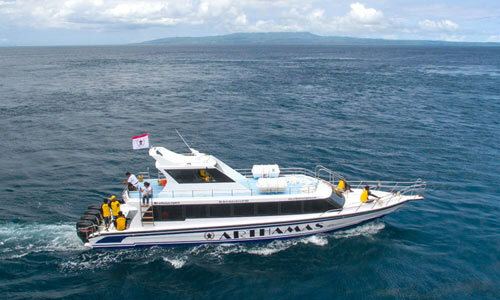 Choose your best fast boat and you will reach Lembongan Island! 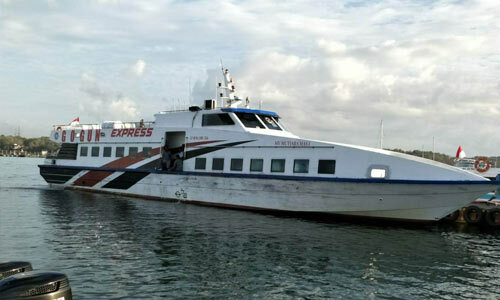 Putri Island Fastboat is Bali's biggest and most sumptuous quick vessel transporting travelers from two ports in Bali to the Gili Islands (Gili Trawangan, Gili Air and Gili Meno) and Lombok. They had build the high speed aluminum traveler fast boat.